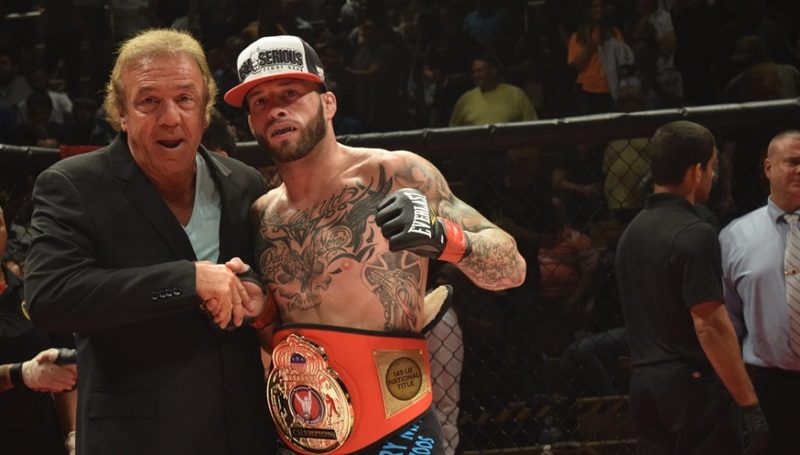 Ring of Combat 56 was another amazing event from MMA pioneer, Louis Neglia. 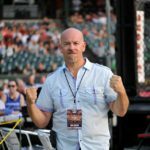 There were numerous highlight reel finishes, and four championship fights that had the sold out crowd in a frenzy. I had the opportunity to talk with Lou right before the first bell. He told me to watch out for ROC alum Gregor Gillespie who is making his UFC debut in Brazil tonight (Sep 24). He also told me that he believed Frankie Buenafuente (145) would be the next ROC champion to make it to the big show. “The Mantis” backed up what Lou said with a dominating performance in the co-main event by defending his title for the first time. Buenafuente was in control vs Brooklyn MMA’s, Nekruz Mirkhojaev, from the jump. He scored a takedown within the first 15 seconds of the fight and was able to mount the very tough challenger. Mirkhojaev was able to fend off the Mantis from doing any heavy damage, but was on the bottom for the vast majority of round one. In round two, the champion feigned a takedown and landed two right hands that rocked Nekruz. He then smelled blood and scored another double-leg and quickly went to mount. There was no other choice for Nekruz except to roll and Buenafuente took his back, deployed some lethal ground and pound, and then locked in a rear naked choke to end the fight just 54 seconds into the second round. That gives Buenafuente five straight wins and puts his record at 7-2. He is on a roll. Mirkhojaev is a talented fighter and he will be back in title contention very quickly, especially if the champ gets the call from Dana White. 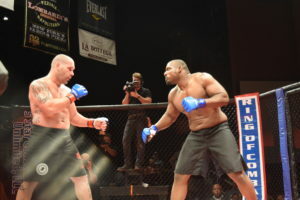 In the main event, heavyweight challenger, Shelton “the Gravedigger” Graves, brought his lunch pail and went to work. He and the defending champ Brutal Brendan Barrett went toe to toe for the first two rounds. In the third, the referee stopped the fight when he said that Barrett was not defending himself. It looked like a quick stoppage and Barrett was not happy at all. BBB protested but to no avail. Graves was the new champ and both guys left everything in the cage like they always do. We could see a possible rematch. Both of these fighters are warriors and put on a great show! K Dojo Warrior Tribe came home with a title, as Ruslan Melikov won the 185 lb belt with a win over Eric “the Viking” Roncoroni. Melikov is a strong grappler and was able to take down Eric in rounds two and three and although he didn’t do much damage at all to the defending champ, he controlled the action. Roncoroni wasn’t able to get his lethal striking going as he was fighting from the bottom a lot in the last 2 rounds. All three judges scored the fight 29-28 and a new champion was crowned. Bradley Desir (Team Tiger Schulman) defended his 155 lb championship against a very tough Julian “Night Train” Lane who took the fight on two weeks notice. Round one was back and forth as both guys landed strikes. It was a very action packed, exciting round. Desir landed a head kick 38 seconds into round 2 and the referee stepped in to stop the fight by TKO. Lane protested as well as his cornerman, Dante’ Rivera. It may have been an early stop, but Lane should keep his head high and definitely deserves another fight at ROC. He is exciting and brings it every time. Desir is a deserving champion who has 1 punch or kick, knockout power. I am looking forward to see who he takes on next, in a very stacked lightweight division.